I love love love this interview! Now we hear it from a 3rd member. First Leader, then Baby, and now Jung Min... SS501 is NOT disbanded, and WILL NEVER BE disbanded! SS501 = 5 forever as 1! For those who have stopped believing in them, I hope you guys believe them now... Thank you so much Jung Minnie! Looking forward to your Facebook account! Jungmin greets and fans and basically talks about how he is learning Japanese and also Chinese now. Everyday, he has 2 hours of lessons on Chinese. He also took out a book that contains words in Chinese (adjectives, verbs, singular words etc) showing how diligent he is in learning now. He hopes that one day, he can speak to the Chinese fans without a translator. Jungmin: I'm very honoured! To join CNR Media, this really outstanding team. I'm really excited! I hope that through their international standing in the entertainment sector, they can help me move towards achieving my goal of being an all-rounded artiste; whether it's music, acting or other areas, I hope through the process of learning, I'll be able to perform my best! Jungmin: Rather than nervous, I should say my feelings are close to shyness. Afterall, I've rest for a quite a while, plus I'm now doing the photoshoot alone. It feels like everyone are all looking at me, making me feel so embarrassed! ** PLAY also mention that Jungmin looked very well and they anticipate his future movie, as well as different genres of his music. They also revealed that other than meeting up with his good friends, Jungmin also went for a holiday with his family members, and he is living very well. Other than acting, Jungmin's company in Korea is also doing very well. Is there a chance of him entering the Taiwanese market in future? Jungmin (Immediately begin to joke): Thank you PLAY! So now I can do a promotion for myself? Everyone's attention is now on my ROYAL AVENUE, right! At the moment, the company is still in the process of growing. Already there are plans to go into markets in mainland China, Japan, Singapore & other overseas markets. However, from what I know, at this moment we have not found any suitable person/company to work with yet. Hopefully in future, we are able to bring to Taiwanese friends the good news! Oh yes! Let me continue more! I want to say thank you here to many Greenpeas Princess, whom, no matter how far it is, they still come all the way to Korea. I seriously love you all! PLAY: Speaking of his business, Jungmin has plenty of creative ideas. However, he also continuously emphasize that no matter how many new ideas that he have, none of this matters more than his artiste works, which is his number 1 priority. After joining the new company for awhile, there's still many detailed preparations to do. 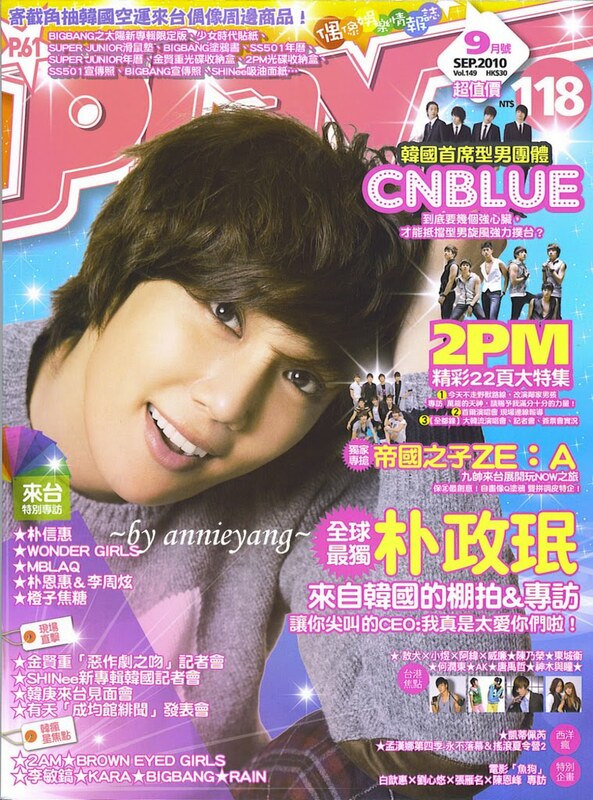 Other than learning new languages, at this moment Jung min is also having "Singing", "Dancing", "Acting" lessons. Not wasting a single minute or section, and fully in an "ON AIR"
PLAY: As Korea is soon to celebrate CHUSEOK festival, how are you going to spend that day? Are there any plans? Jungmin: CHUSEOK is a very important festival. On that day, we Koreans will definitely celebrate it with our family. I am now living with my father, mother and sister, therefore if there is no schedule on that day, I think I will be staying at home to help with the housework, while waiting for my big brother and his wife to bring all my nephews(and nieces) over for dinner! After that, this year I would like to wish for an important wish in front of the mid-autumn moonlight. About the contents of my wish....I will let all of you know in September! PLAY: Even though he is only celebrating the festival is such a simple manner, Jungmin still continues to smile brightly, resulting in the people around to feel full of happiness. Jungmin: Maybe it is the typical O blood type and Taurus sign! I am quite optimistic, always keeping a good and happy feeling, and facing people around me with a smile. I will feel happiness just doing that, seeing how everyone's mood is happy as well, I will be happy myself! PLAY: Jungmin's bright smile caused the cold (due to air-conditioner being turn on to a high degree) filming site be filled with warm. To be a good boss, the most important thing is knowing how to use the right person, to do the right thing. To understand the company situation in a down-to-earth manner, it is important to always encourage the workers, and understand their point of view! Jungmin feels that there is no other better way to let himself improve than through better understanding. 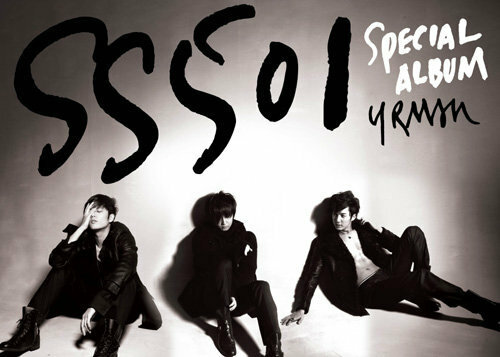 SS501's members is going solo, but we are not disbanded. In future, we will not disband either! Among us, other than Hyun Joong who has entered the filming of " Mischievous Kiss", Young Saeng, Hyung Jun and Kyu Jong are all in an "OFF MODE". After all, we have been working for some years and we haven't had the chance to rest properly. Therefore, we are using this chance to fully rest and recharge. Perhaps after that, we will have different growth in terms of thinking. Right now, we are communicating through text messaging to let each other know each other's progress. A few days ago, I just met Hyung Jun to have dinner! After a while, when everyone's body and mind has received sufficient rest and preparation, we will continue to plan for 501's activities. I promise that once there is news, we will immediately inform everyone. At that time, you all must be there! Recently, I plan to open a FACEBOOK account. After it's completed, Princesses you all have to come take a look! PLAY: Previously Jungmin has mentioned that his quote in life is "Forever with a grateful heart, to help those who need help"
After switching to a new company and starting his new path, Jungmin has not changed this view of his. Jungmin: I think I will always hold on to this viewpoint throughout the rest of my life! PLAY: Jungmin says after moving to a new home, it does not mean that he has cut off relations with his previous company (DSP). Whenever he is free, he will still return to DSP to walk around. "I can also visit our juniors as well, and see if they are seriously working hard! HAHA!" Jungmin also says that he is very grateful to DSP for grooming him. Towards this grateful feeling, he will always keep it in his heart, just like this quote in life, this will never change.